This weeks draw was held in Moores anJoanne Towey of Goodfellas Barbers, Swinford won €627. Envelopes are available in most business premises and online through www.swinfordgaa.ie where tickets can be purchased in bundles of 10/25/52 weeks. Next draw is in Quinns Bar on the 4th April. Draw envelopes are available at 3 for €5. Club membership is now open. Non playing membership is €20, Adult Player €60, Student Player €50. Please contact a club official. 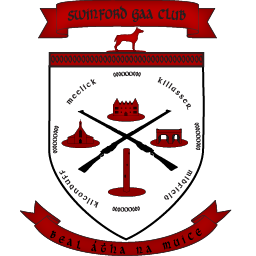 We are happy to announce that the Under 14 and Under 16 teams from Sean McDermotts Club in Birmingham will be coming to Swinford on the weekend of 31st March/2nd April. This is part of the celebrations of the 60th anniversary of Sean McDermotts GAA. On Saturday 1st April we will be hosting a Under 14 tournament between Swinford, Sean McDermotts, Ballyhaunis and Moy Davitts. These matches will start off from 11am at Robert McCallion Memorial Park. Following this the Swinford Under 16 team will play Sean McDermotts Under 16’s. We will all then meet up in the Gateway Hotel for refreshments and a presentation ceremony. Everybody is welcome to support the various teams. Swinford GAA Bord na Og Church Gate collection will be at all masses on the weekend of the 8th & 9th April.